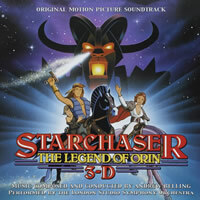 BUYSOUNDTRAX Records presents the original soundtrack to STARCHASER: THE LEGEND OF ORIN, featuring music composed by Andrew Belling for the 1985 3D animated science fiction film directed by Steven Hahn, written by Jeffrey Scott, featuring the voices of Joe Colligan, Carmen Argenziano, Noelle North, Anthony De Longis, Tyke Caravelli and Les Tremayne. STARCHASER tells the story of Orin (Colligan), part of a tribe of humans who are forced to excavate the rare crystals of Mineworld by the evil Zygon (De Longis) and his technologically superior army. Similar to Fritz Lang’s METROPOLIS, Orin and his people are kept in line with the belief that the world above them has been destroyed and if they continue to work hard and reach their crystal quota, their God will reward them. One day while he is digging, Orin finds a mysterious sword-hilt with a magical energy blade that only responds to his command. Holding the sword-hilt for the first time releases a hologram of a bearded man who encourages him to defy his captors and seek the freedom of the world above. Spurred on by the death of his loved ones, Orin makes his escape, digging his way up to the planet’s surface to discover a sky full of stars and fresh air to breathe. Exploring the surface, Orin meets Dagg (Argenziano), a gruff smuggler known for his predilection for fembots and merciless treatment of mandroids. Orin joins Dagg on board his spaceship, the Starchaser, computer controlled by Arthur (Tremayne), who sounds more like an English butler than a pilot. Orin journeys from one end of the galaxy and back, trying to discover the origins of his mysterious weapon and how he can destroy Zygon and free the people of Mineworld. STARCHASER: THE LEGEND OF ORIN was produced in Hollywood and animated in South Korea. For the first time, the film’s 3D animation would be computer controlled,iIncorporating a unique process that would involve the use of a pair of large plotters, resulting in a three-dimensional effect even among characters that are two-dimensional drawings. The final touch in bringing to life the film’s exciting adventure story is the lavish orchestral score composed by Andrew Belling. Meeting with first time director Steven Hahn, Belling was encouraged to write a large scale orchestral score, evocative of John Williams’ work on the STAR WARS films. The film’s producers informed him they had enough in the budget for a large orchestra, which would give Belling the opportunity to have his first major orchestral score performed by the same 90-piece orchestra that had performed on the scores for the STAR WARS films, the London Symphony Orchestra. His score for STARCHASER is a mix of orchestra, electronics, and drum-loops, the latter giving the film’s memorable main theme its constant, purposeful drive. In addition to its unique 3-D visualization, STARCHASER was also mixed in surround sound, a 5-channel stereophonic process, with 3 channels in the front and 2 in the rear, which had been growing in popularity as cinemas moved from the traditional monophonic sound process of previous decades into a more immersive aural experience, which allowed Belling to mix the score’s electronic elements in a way that would take advantage of the sonic dimensionality inherent within the process. Andrew Belling began his career as studio musician/arranger, working with a number of popular artists. He later became involved with feature films as an orchestrator and composer in the early 1970s. After scoring a handful of television movies and independent films, Belling was hired by Ralph Bakshi to score his animated fantasy film WIZARDS in 1976. BUYSOUNDTRAX Records presents the world premiere soundtrack release of STARCHASER: THE LEGEND OF ORIN, featuring music composed and conducted by Andrew Belling, performed by the London Studio Symphony Orchestra, mastered by James Nelson of Digital Outland. The booklet contains liner notes written by noted author Randall D. Larson and includes comments from the composer. STARCHASER: THE LEGEND OF ORIN is a limited edition release of 1000 units. The first 100 copies sold through our website will include a booklet autographed by composer Andrew Belling.